haay sarap ma-upgrade. especially when you're flying thai airways from bangkok. we're in the royal silk lounge, which is for business class passengers. 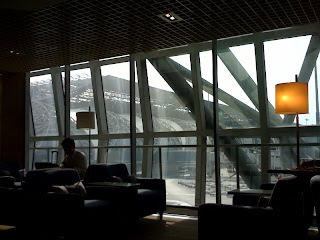 it's nice and quiet with a view of suvarnabhumi airport's sail-like architecture. o sha breakfast muna kami habang nag-fe-facebook. see you in manila! upgrade was courtesy of khun nivat of thai airways. khap khun kha!